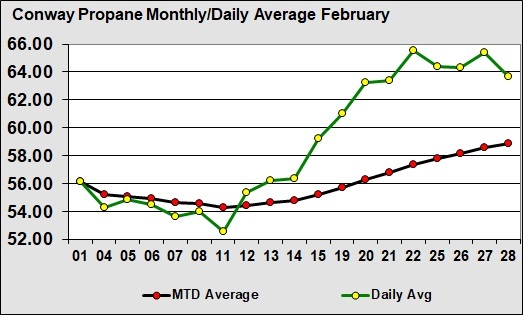 Midwest propane inventory fell below 10 million barrels for the week ending March 8. This comes after a 1.324-million-barrel drop. Midwest inventory is now 742,000 barrels less than it was last year. 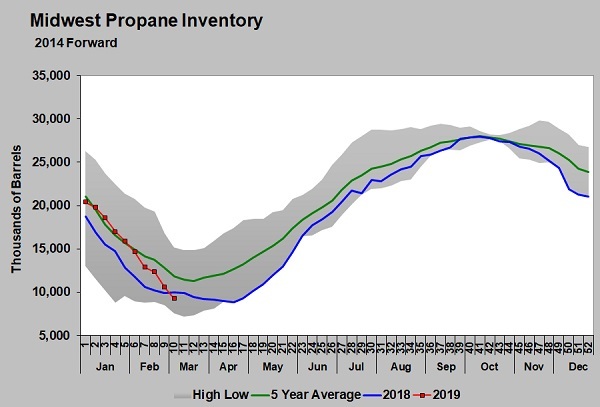 The drawdown in inventory seemed to help Conway propane values in February. Conway easily outperformed Mont Belvieu LST last month, but the chart below shows the discount to Mont Belvieu LST is starting to increase again. At the end of February, the discount to Mont Belvieu LST was down to 3.75 cents (see red line above), but the spread is about 7 cents again in March. While Midwest inventory dropped more than 1.3 million barrels last week, Gulf Coast inventory increased 1.164 million barrels. Yet, Conway’s values continued to slip against Mont Belvieu’s. Given the difference in inventory positions, the inability for Conway to gain in relative value to Mont Belvieu LST suggests traders are not worried about Midwest inventory being adequate. As the top chart shows, by the end of last winter Midwest inventory was even lower than it is now. Inventory fell to 8.876 million barrels before beginning its build. 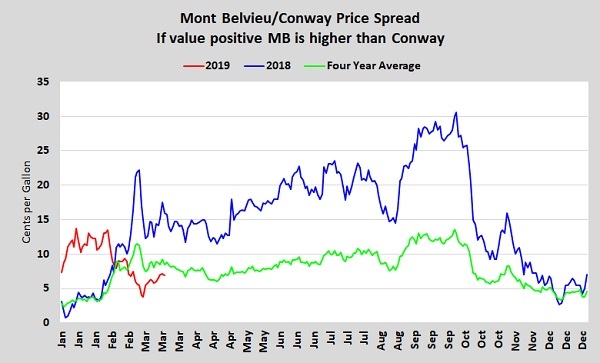 Even after falling to that low of a level, the last chart shows the spread between Mont Belvieu and Conway propane was wide in 2018. With such high propane production in the Midwest, there is little need for the region to carry a lot of inventory. Producers are trying their best not to store product in the Midwest, and are instead moving it to the Gulf Coast or East Coast for export. That could change after this year. 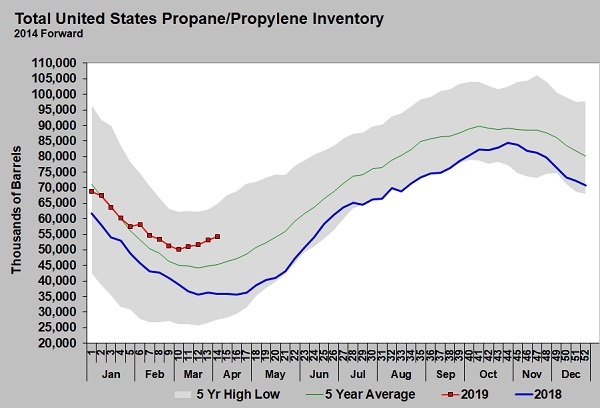 It is our understanding that Canadian producers are aggressively pushing propane into the U.S. market in 2019. However, they could have better options available to them beyond 2019. 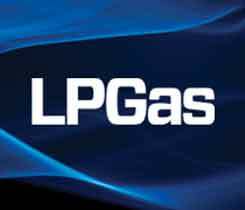 Much of western Canada’s propane has been pushed in the U.S. market due to lack of other options. A newly operational export facility on Canada’s west coast could change the way product moves in the future. 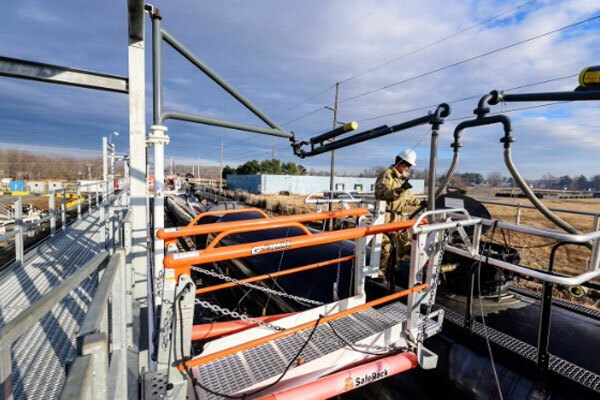 Canada also is committed to building up its own petrochemical industry to take advantage of its abundant and cheap natural gas liquids supply. Also, 2019 is the first full year we can monitor the impact of the Mariner East 2 pipeline. The pipeline could allow additional supplies to move to the East Coast out of the Marcellus and Utica shale plays. The disruption of the Mariner East 1 pipeline has limited the impact up to this point. For that reason, it is very possible 2018 and 2019 could represent highwater marks for the discount where Conway propane trades below Mont Belvieu propane. 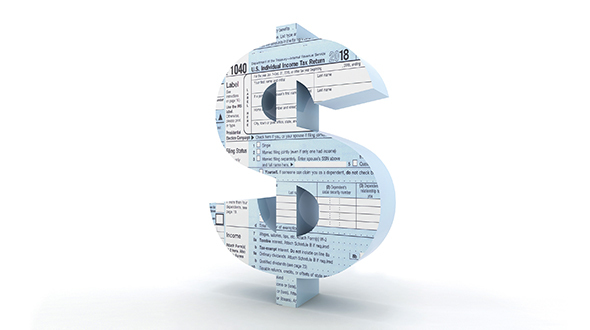 Dealers in the Midwest may be getting spoiled by the abundant and cheap supplies available to them, but they should start preparing for a time when that may not be the case.